Whitehaven's Maceo Boyd, a 5'-10", 180 lb. class of 2019 DB, recently received his 1st offer from Delta State University. I hope this is the 1st of many. Way to work Maceo. This summer promises to be a busy one for Briarcrest class of 2020 football standout Jabari Small. Small, a 5-10, 170-pound athlete, picked up an offer from Tennessee on Monday night to add to his constantly-growing list. Arkansas, Central Michigan, Cincinnati, North Carolina, Southern Miss and UAB are among the others who have offered. He heads into the season as the state's No. 15 junior prospect according to 24/7 Sports. Small was a standout on both sides of the ball for the Saints in 2017, helping the team to a 9-2 record. He caught 22 passes for 266 yards and three touchdowns while leading the area in average yards per punt return (28.2, one touchdown). Expect Small's offensive numbers to shoot way up in 2018; the Saints boast the top returning passer in quarterback Jackson Walker (2,526 yards) and will be replacing their top two receivers. As one of the state's top receivers, Keveon Mullins is used to reversing his field. He did it once again on Thursday. Mullins, the class of 2019 standout at Whitehaven, announced on Twitter that he had verbally committed to play his college football at South Carolina. The 6-2, 200-pounder had committed to Memphis in April before deciding to re-open his recruitment. 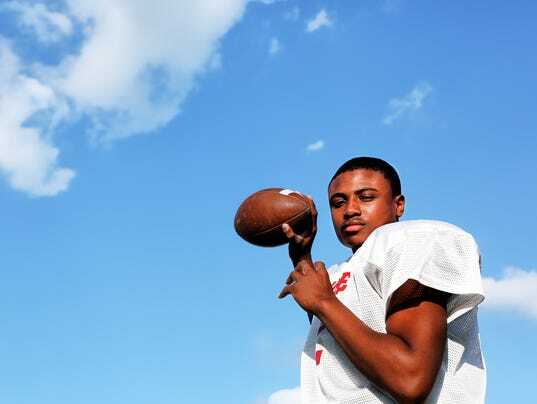 Mullins — who will play at Whitehaven after transferring from East — is the top returning receiver in the Shelby-Metro area. As a junior, he caught 52 passes for 1,011 yards and scored eight touchdowns while averaging 91.9 yards per game. He enters the season as the state's 12th-ranked prospect, according to 247 Sports' composite rankings. Only No. 10 T.J. Sheffield of Independence and 11th-ranked Jayden Harrison of Nashville Pearl-Cohn are ranked higher than him at receiver. He joins Whitehaven teammate Devin Boddie Jr. as Tigers who have committed to SEC schools. Boddie, a transfer from Lausanne, announced for Vanderbilt on Wednesday. It's no secret head coach Jim Harbaugh likes his teams to run the football. From his time at Stanford, Harbaugh has been known for his gap-based run schemes. That has been the case at Michigan, too, for the most part. One difference? Harbaugh hasn’t had a lead back like former Stanford running back Toby Gerhart. The Wolverines have yet to have a 1,000-yard rusher under Harbaugh, who has been more than happy to spread carries around. Last season, Karan Higdon and Chris Evans combined for 299 carries for 1,679 yards and 17 touchdowns. Both return this year — Higdon is a senior and Evans a junior. Michigan, though, appears poised to reload once Higdon and Evans are gone. They’ve signed four running backs in the past two recruiting classes, and now have a pair of commitments from highly touted 2019 4-star prospects Zach Charbonnet and Eric Gray. Charbonnet, at 6-feet-2, 215 pounds, might seem like a prototypical big back. At 5-10, 191, Gray is classified by recruiting services as an all-purpose back. Both, though, boast skill sets atypical for their respective sizes. "You know, people overuse the ‘Thunder-Lightning’ term," 247Sports recruiting analyst Steve Lorenz said, "but I really think Charbonnet and Gray would be as close to a ‘Thunder and Lightning’ combo as you’re going to get as far as two high school running back verbal commitments." Charles Collins, Charbonnet’s head coach at Oaks Christian School in Westlake Village, Calif., had two comparisons for his star running back’s style of play. “When you look at running backs that have come out recently, and also really in terms of character as well, I would liken (Charbonnet) to Saquon Barkley,” Collins said. “Might be just as big, that can run, also has wiggle and more importantly, you’re talking about a team guy and high-character guy. That’s Zach Charbonnet in a nutshell. Those are lofty comparisons. Based on probability alone, it’s unlikely Charbonnet will replicate Barkley or Bell’s college production at Penn State and Michigan State, respectively. But one trait Charbonnet shares with both is his potential in the passing game. According to Collins, when his team participates in agility drills, Charbonnet — who has “always had good feet” — works with the receivers. He has even played some defensive back when Oaks Christian needed help in the secondary. As a junior, he caught 27 passes for 169 yards — nothing extraordinary, but enough to show that Oaks Christian wanted to involve him in the passing game. Then there’s Charbonnet’s ability to run the ball. As a junior, he took 265 carries for 2,049 yards (7.7 YPC) and 23 touchdowns, according to unapproved website. His film shows a running back with size who cuts well, displays good vision and has decent acceleration and long speed. “I think the best thing he’s doing now is, outside of just being a heck of an athlete, now he understands how to read fronts,” Collins said. “The game has slowed down for him. He’s not just playing with his athleticism or his talent. Lausanne head coach Kevin Locastro has an anecdote that perfectly describes Gray, Tennesee’s reigning two-time Mr. Football award winner in his classification. When Gray was younger, Locastro put his team through a drill where the running back had to put a move on a linebacker stepping up in the hole. It was something Gray excelled at. Look at Gray’s film, and you’ll see a lot of the same thing. He can make anyone miss, and often does so multiple times on the same play. According to Locastro, Lausanne’s scheme boils down to something simple: get the ball in Eric Gray’s hands. Lausanne doesn’t just hand it off to him, either. They’ll also use him as a weapon in the passing game, on angle routes, seam routes and wheel routes. Over the past two seasons, he has a combined 21 receptions for 487 yards and seven touchdowns, to go with a combined 553 carries for 5,366 yards and 83 rushing touchdowns. 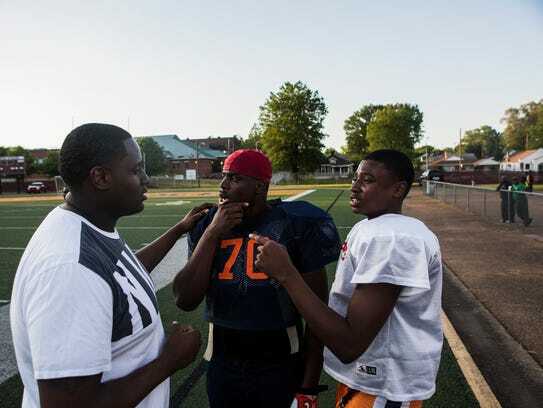 According to his father, Eric Gray Sr., Michigan has a specific role for his son in mind. Gray’s size suggests a future as a back who can provide a change of pace. But Locastro believes otherwise. He thinks Gray can be an every-down back — and that he’ll be comfortable running between the tackles. Gray might not look like an every-down back. But size hasn’t deterred Higdon ( 5-10, 189) or Evans (5-11, 200). Gray is capable of taking on a similar workload, and he’s already a weapon who can be used in multiple ways. And Charbonnet has the size of a workhorse running back and also possesses skills that could make him a threat in the passing game. And the two could become Michigan's next one-two running back punch. Lausanne running back Eric Gray (Michigan), Pearl Cohn wide receiver Jayden Harrison (Vanderbilt), Science Hill offensive tackle Blake Austin (Coastal Carolina), FRA athlete Lance Wilhoite (Oregon), Cordova offensive lineman Matthew Bedford (Indiana), BGA linebacker Chico Bennett (Georgia Tech), Whitehaven athlete Devin Boddie (Vanderbilt), Red Bank athlete Calvin Jackson (Wofford), Whitehaven athlete Keveon Mullins (South Carolina), Fulton linebacker Robquan Thomas (Austin Peay), Davidson Academy quarterback Stone Norton (Florida International), Christian Brothers defensive end Christian James (Vanderbilt), Germantown tight end Conner Richardson (Tulane), Dyersburg linebacker Chris Russell (Memphis), Karns athlete Thomas Harper (Oklahoma State), MBA linebacker Jackson Hannah (Nebraska), Siegel defensive end Joseph Anderson (South Carolina), Davidson Academy running back Da’Joun Hewitt (Purdue), Davidson Academy defensive end Ani Izuchukwu (Mississippi State), Greeneville wide receiver Dorien Goddard (Virginia), Memphis Central defensive tackle Trevis Hopper (Memphis), Greeneville tight end Cameron Hite (Wake Forest), Christian Brothers defensive end Bill Norton (Georgia), MUS defensive back Maurice Hampton (LSU), MBA offensive lineman Jackson Lampley (Tennessee), Kirby quarterback Jaden Johnson (Louisville), and Friendship Christian defensive tackle Luke Smith (Appalachian State). The Chris Smith Class of 2020 Watch List. 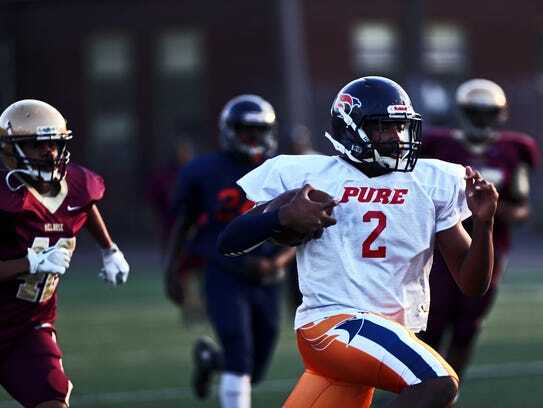 Tevin Carter, a rising freshman quarterback, receives college offers. "He's a guy with unlimited potential," said Thomas Morris, who operates the local arm of QB Country, which offers instruction to quarterbacks from fifth grade up. Germantown's Cameron "CB" Baker, a 6'-2", 180 lb. WR/QB, has received offers from Howard University, Indiana, Eastern Kentucky, UT Martin, Mercer and Austin Peay University.